People born in the year of the Ox effortlessly possess raw strength, high standards of achievement, industry, reliability and steadfastness. 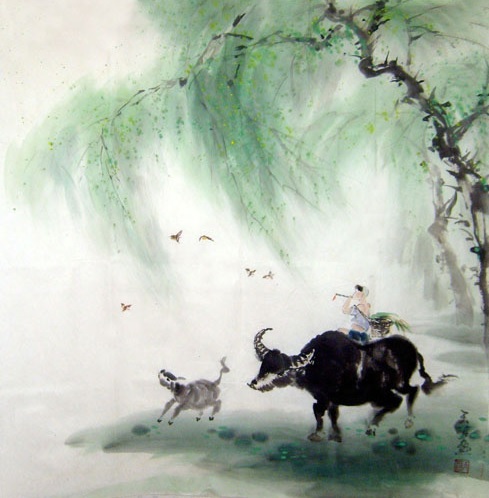 A yin animal, the Ox is also the symbol of a nurturing parent and a reassuring leader in China. 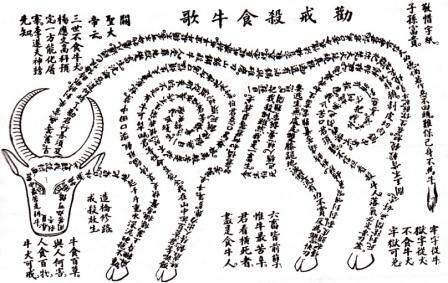 The Ox, Buffalo, Bull or nu and chou in Chinese is also called the Spring Ox and is the second symbol in the Chinese zodiac. It also represents the last month of the Chinese winter and the earth element. This is the time when the gentle oxen start ploughing the field. Many venerated personalities in China used the Ox as an emblem. Shen Nung or Shennong, the father of agriculture in China, is often depicted with an Ox's head. Lao Tse rode on a team of oxen toward the western borders. There are many spiritual temples in China and Japan that are decorated with the images of oxen. The perfection-oriented Ox also brings lessons to be learned for Ox people and for anyone who is presented with it as a symbol. The well-mannered Ox thrives with the Rat, Snake and Rooster, but its worse comes out when provoked by the Horse, Dog and Sheep. If you are born in the year of the Ox, your wardrobe may do better without the colors white and green, while the numbers 3 and 4 may mark ill luck for you. Old folks also say that a child born in the year of the Ox is highly energetic and rarely gets sick. 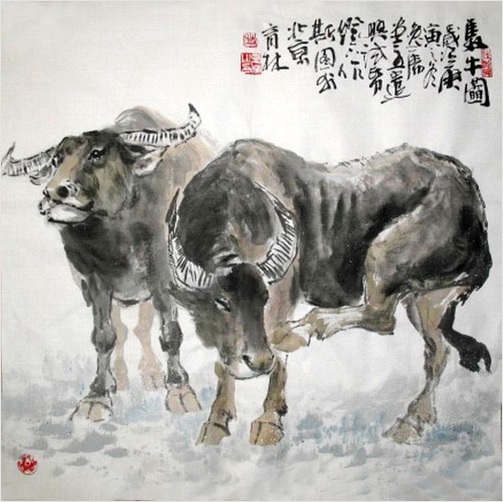 The Ox also signifies the season of spring, when work on the land began with the ceremonial ploughing, the one time of the year that the ancient emperors of China actively take part in. Chinese people from way back used to make clay figurines of buffaloes and oxen in the winter. The clay statuettes symbolically drew in the cold, and then the people place them outside their homes in the Spring to symbolize nature's rejuvenation. In the olden days, and sometimes even today, many Chinese will not butcher a cow or an ox. They believe it is not right to kill and eat the creature that deserves their gratitude as it helps them with the harvest. This tradition was most widespread since Buddhism was introduced in the country. Buddhist leaders imposed a ban on all meat, especially beef. There were also emperors during the medieval times who have declared that people be prohibited from slaughtering and eating oxen. South China was also home to temples built by a popular cult of the ox that also practices non-consumption of oxen. There were temples for the legendary Yellow Ox. In the city of Lo-yang, the ancient people were believed to have witnessed the fight of two black and two blue oxen that rose from the river. The Chinese used to throw stone or bronze figures of oxen in rivers if the dykes were threatening to give way. This is a symbolic ritual for protection, as the Ox lends its immense strength to the damaged dykes. Aside from legends of the Ox's extraordinary grit, there were also old tales of an Ox that burst forth from a tree-trunk. This huge Ox then made its way into the river and the ancient people worshiped it as a water god. You can use the symbolisms of the Ox when you need to gain foresight, open-mindedness and patience, as well as if you would like to be empowered, successful, calm and confident for a certain goal. See me through in my weakest hour. May this Symbolcast provide you the virtues of the mighty Ox! To know more about Symbols and Symbolisms? Go to the Symbolisms homepage for more information. 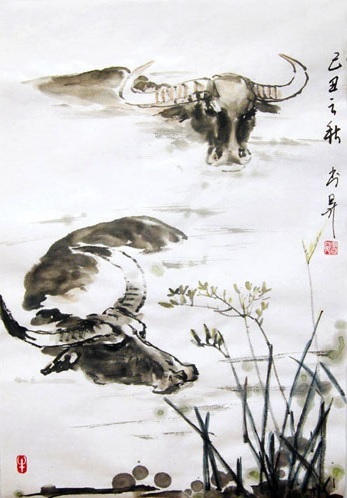 *Many thanks to Xia Shu Sheng (1st and 2nd painting from top), Tian Ya (3rd from top), and Shi Yu Lin (4th from top) of inkdancechinesepaintings.com for the beautiful Ox paintings featured on this page. 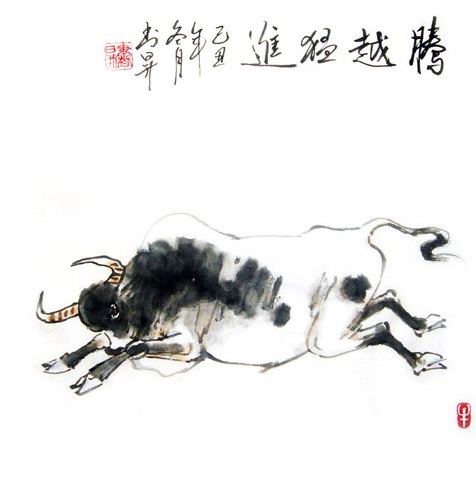 The Ox illustrated using Chinese characters is from an old anonymous Chinese document. Symbolcast verses by poet PJ Blunn.